Fun, contemporary school portrait photography capturing your childs natural unique personality. Janine is a mother of 4 young boys with over 15 years experience in photography. She started her business in school photography in Biggleswade running frundraising days, she runs a successful studio in the town. Janine now has a team behind her to help her expand this area of the business. 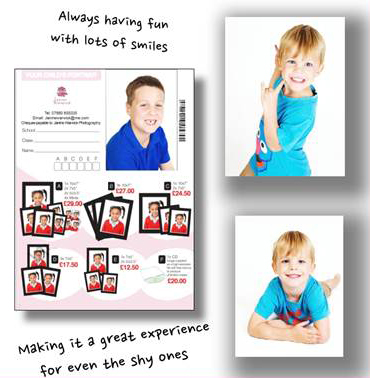 Janine’s photos are purchased because they are excellent, they show the child in the best light with natural smiles. You’ll find Janine at her most comfortable on her knees talking to children able to relate to all ages, making them relax. Gone are the days of the dated school photos. Janine will come by and have fun meeting all your wonderful children with her collar straightening skills! 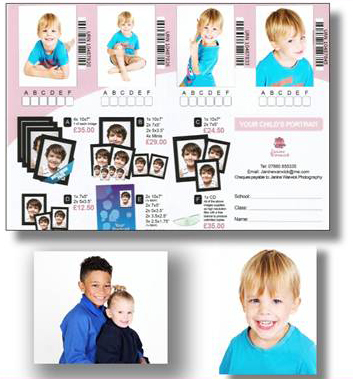 We think its time the school photos are brought with joy and not guilt. 10% of sales from the day will be donated to your PTA. We are happy to arrange with your help, sibling and class photography. Janine started her business with Portrait days over 7 years ago and each year it just keeps growing. It’s a great way to Fundraise for you PTA or Charity. You host a portrait day and charge a sitting fee which you keep, this is usually £5.00. You will also receive 10% of the sales. Janine has a great professional Mobile studio, your space needs to be at least 3x3meters to accommodate the Backdrop. If this is a problem please contact us and we can arrange a day here at our studio. The packages are discounted and really great value.